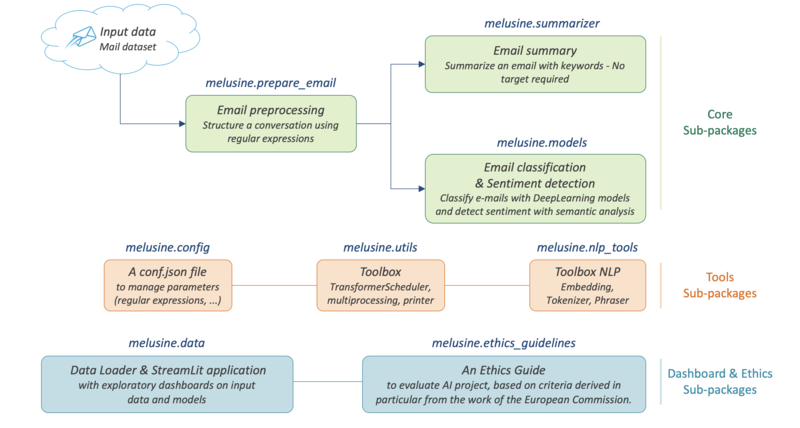 Melusine is a high-level Python library for email classification and feature extraction, written in Python and capable of running on top of Scikit-Learn, Keras or Tensorflow. It is developed with a focus on emails written in french. 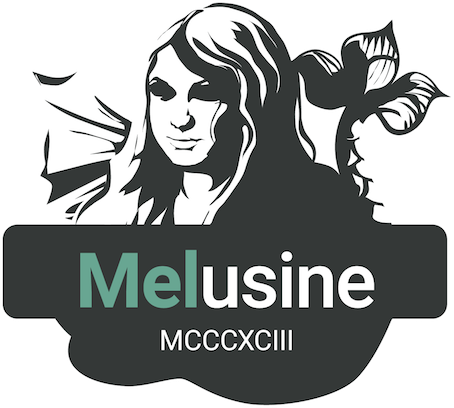 Melusine is compatible with Python >= 3.5. This package is designed for the preprocessing, classification and automatic summarization of emails written in french. prepare_email : to preprocess and clean emails. summarizer : to extract keywords from an email. models : to classify e-mails according to categories pre-defined by the user. nlp_tools : to provide classic NLP tools such as tokenizer, phraser and embeddings. utils : to provide a TransformerScheduler class to build your own transformer and integrate into a scikit-learn Pipeline. An other subpackage is also provided to manage, modify or add parameters such as : regular expressions, keywords, stopwords, etc. config : contains ConfigJsonReader class to setup and handle a conf.json file. This JSON file is the core of this package since it's used by different submodules to preprocess the data. body : the body of the email. It can be composed of a unique message, a history of messages, a transfer of messages or a combination of history and transfers. header : the subject of the email. date : the date the email has been sent. It corresponds to the date of the last email message. from : the email address of the author of the last email message. to : the email address of the recipient of the last email message. is_begin_by_transfer : boolean, indicates if the email is a direct transfer. In that case it is recommended to update the value of the initial columns with the information of the message transferred. is_transfer : boolean, indicates if the email is a transfer (in that case it does not have to be a direct transfer). meta : to access the metadata of the message as a string. text : to access the message itself as a string. date : the date of the message. from : the email address of the author of the message. to : the email address of the recipient of the message. header : the subject of the message. part : to access the part of the message as a string. tags : to access the tag of the part of the message. last_body : string, corresponds to the part of the last email message that has been tagged as BODY. clean_body : string, corresponds a cleaned last_body. clean_header : string, corresponds to a cleaned header. clean_text : string, concatenation of clean_header and clean_body. tokens : list of strings, corresponds to a tokenized column, by default clean_text. keywords : list of strings, corresponds to the keywords of extracted from the tokens column. RE/TR : any metadata such as date, from, to, etc. GREETINGS : any greetings such as Salutations. FOOTER : any footer such as Provenance : Courrier pour Windows. HELLO : any salutations such as Bonjour,. BODY : the core of the the message which contains the valuable information.